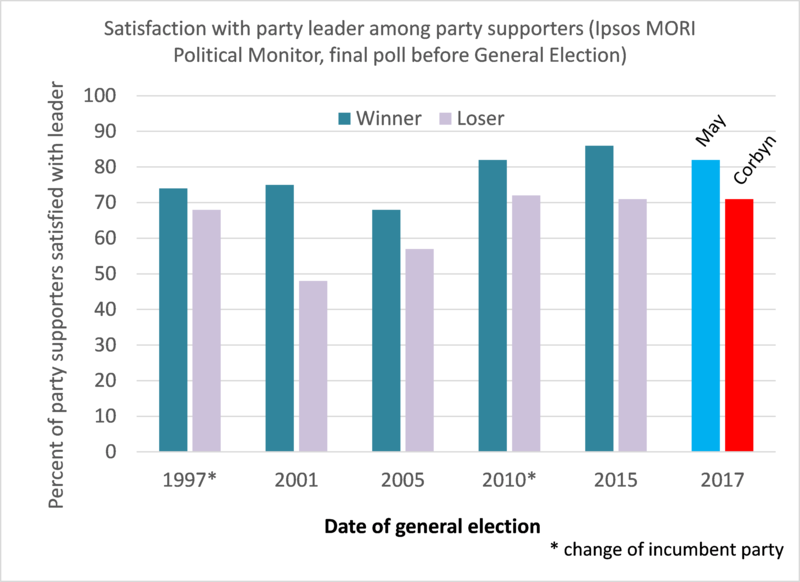 Will leader satisfaction among party supporters predict GE2017? Update: And the size of that majority? I’ve no evidence of that. My feeling is about 50 seats. As a Political Studies Association member I was invited to complete the PSA ‘expert predictions’ survey in mid-May (when the Conservatives were doing very well in the polls). At that time I gave the Tories a 20 % chance of a 100+ majority and a 1% chance of a 150+ majority – that put me in the lowest decile of the expert predictions! So, we’ll see. Here is the table from that survey (which was taken before the recent Labour surge in the polls). Post-election update: Well, along with most other predictions (but not all) I was quite wrong about the Conservatives increasing their majority! Instead, they lost seats and Labour gained substantially, though the Conservatives remain the largest party. The final seat counts are Cons 318, Labour 262, SNP 35, Lib Dem 12, DUP 10, Sinn Fein 7, Plaid Cymru 4, Green 1, Other 1. So Theresa May hangs on with the help of the Democratic Unionist Party. The leader satisfaction ratings, however, did predict that Conservatives would end up ahead of Labour. I still think these ratings are a good measure of voter intent, despite the fact that they don’t predict the size of the lead, nor (as I failed to notice) do they predict that the leading party will have an overall majority. For what it’s worth, I was among the 10% of PSA survey-takers who correctly surmised that the chance of a large Tory majority was low.